Which piece is your favorite? Did I miss anything you find lust-worthy? Let me know so I don't miss out! OMG I'll take one of each of these beauties! I'm dying to try that color on my lips but I'm not entirely sure I can pull it off. 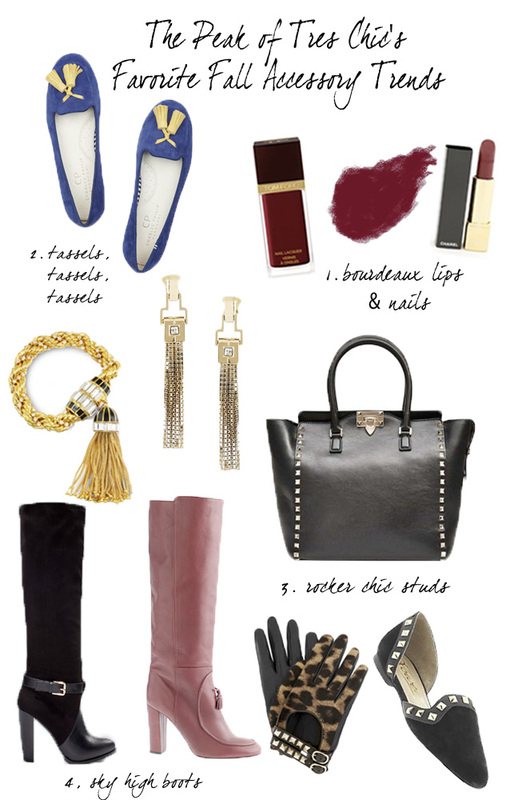 Love everything you picked out- especially those tassel loafers! I think I need to get my hands on some tassle loafers for sure. I'll probably sit out the burgundy trend, even though I am seeing it everywhere! It's just never been me. Those tassel loafers are adorable!! looooving those loafers and gloves!! I'm loving the tassel trend also! If you buy something, make sure and share! All about tassels too! And I was so excited to see that those black boots are Zara! I LOVE tassles! And those studded loafers are dope! I recently got a pair of loafers with tassels and I love them–they're so charming! I completely adore anything with tassels! and I can't wait to try out the bordeaux lips! I love the tassel bracelet and the bordeaux lips and nails! I always get most excited about fall fashion! I absolutely adore the bag and the tassels! I already got a pair of leopard ones and I love them! Can't wait to paint my nails that pretty deep red color! Love all the pretty fall trends! these are all fab!! and exactly the right inspiration. I love the tassels on the shoe look. I have a pair of heels from like 10 years ago with tassels. They had been hiding in my closet. So happy I get to take them out after such a long time. I love how fashion repeats itself and finds its way back. All of your picks are gorgeous!! I'm not a big lipstick girl, I just haven't taken the plunge yet but I am loving bordeaux lips and nails so maybe it's time to go for it! I am currently loving anything and everything animal print. Especially leopard!! Fall is one of my favorite times of the year! Gosh I love that bag!!! Ohh Ohhh Ohhh. I'm all over your trends especially the tassels! !